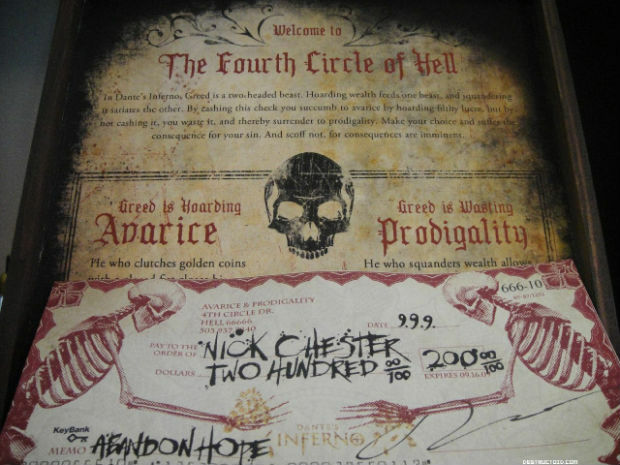 You may have heard some rumblings: Yes, as a promotion for Visceral Games' forthcoming multi-platform Dante's Inferno, Electronic Arts sent out $200.00 checks to select members of the media. Why? The decorated wooden box contains the check you see above, which I can confirm is an actual no joke legal check that I could cash at a bank (and likely get a lot of funny looks). The dilemma is such -- do I give in to greed and cash the check, and basically kiss any credibility I might have goodbye? However, if I don't cash it, that could be considered wasteful. "He who squanders wealth allows the first fruits owed to heaven to rot on the vine," explains the words on the inside of the box. Quite a conundrum. We're still scratching our chins over this one, but we have a few ideas, which you can find after the jump. What do you think we should do? Pay some bills, give Dante's Inferno a 10 out of 10. Reserve 20 copies of Dante's Inferno. Reserve 20 copies of God of War III. Buy $200 worth of booze, let Dale North drink it on a web cam all day long. Give it a charity, maybe Child's Play. Sign it over to Kotaku's Brian Crecente, who decided to burn his check. It's possible he's regretting his choice, and we'd love to give him another chance.